Ella Lister examines recent fine-wine market performance, with a special focus on Bordeaux, before looking back at auction results over the course of 2014 and continuing her series on wine exchanges. 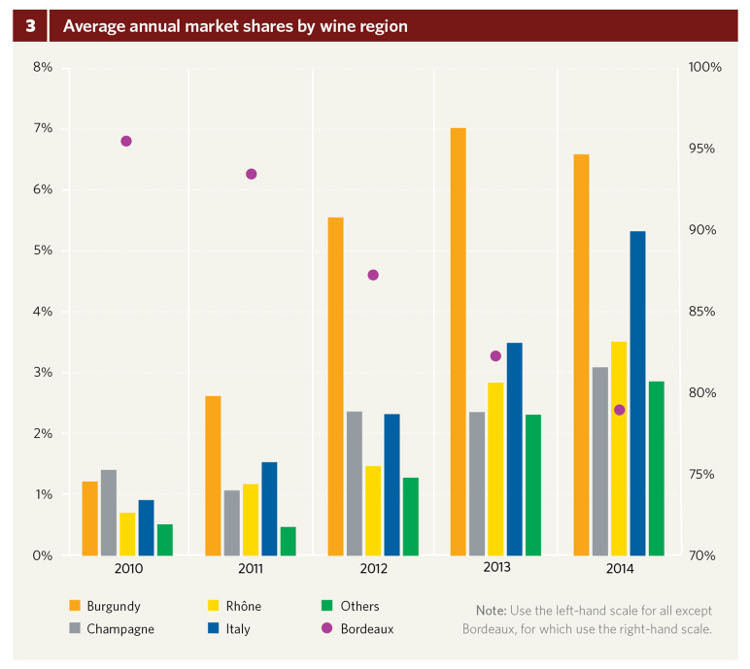 First the bad news: The fine-wine market experienced losses across nearly all wine-growing regions in 2014. The only Liv-ex index to rise, by 3 percent, was the "rest of the world" index, comprising the likes of Dominus and Penfold's Grange (fig.1). For the Bordeaux-dominated Liv-ex 100, down 7 percent, this meant a fourth consecutive negative year. The Bordeaux first growths fell furthest, by 9 percent. Even the broader Liv-ex 1000 lost 5 percent over the 12-month period. Now the better news: Toward the end of last year and continuing into 2015, some of these indices showed green shoots. Following 17 months of decline, the Liv-ex 100 index saw four months of (admittedly modest) gains to November 2014 (fig.1) and was flat in December. 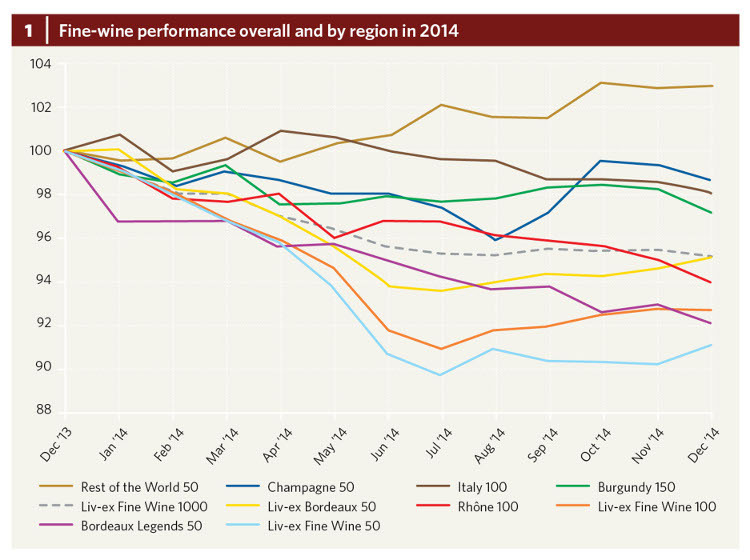 Half of the eight sub-indices in the Liv-ex 1000 (those shown in fig.1) made gains from June to December 2014, most notably the Bordeaux 500, boosted by non-first-growth red wines from the Left Bank, as well as the first growths' second wines. Even the first growths seem to be emerging tentatively from the doldrums: The Liv-ex 50 was completely flat in the second half of 2014. For Wine Asset Managers, this came "as a relief, given the prolonged period of decline prior to that," they said in their November newsletter (though they had noted the previous month that "trade in first growths remains laboured"). This even keel seems to be ticking upward. The Liv-ex 50 gained a percentage point in December and another two in January (fig.2). "I'm feeling very positive about the coming year," asserted Hew Blair, chairman of Justerini & Brooks, in January. His counterpart at Goedhuis & Co, Johnny Goedhuis, is equally positive: "I'm always pretty bullish, and I'm just beginning to feel there is more interest in Bordeaux than there has been for a number of years." However, both agree that something needs to change for the 2014 en primeur campaign if it is to have any influence. "If it was genuinely priced well and the quality was there, Goedhuis & Co would have a market for the 2014 wines," says Goedhuis. The 2013 campaign was a sideshow for the merchants, for Justerini & Brooks representing only one twentieth of its 2009 results. For Goedhuis & Co, 2013 revenues were half those of 2012, which were already down by 80 percent on 2010, just before the Bordeaux crisis hit in the summer of 2011. And we can call it a crisis, even if the Bordelais are putting on a brave face (or hiding their faces in the sand). "It's the last-chance saloon for the Bordelais," insists Blair, adding, "They've really got to listen this time." Goedhuis predicts "a cash-flow crisis in Bordeaux for certain châteaux and négociants," if en primeur doesn't sell this year. Former merchant Steven Spurrier goes further, believing it's already too late for the Bordelais to revive en primeur. He argues that "Bordeaux has relied on a structure that's been proven no longer to work." Spurrier makes a droll analogy with Georgian mahogany furniture, which has become deeply unfashionable in recent years, declaring that "Bordeaux is in a brown-furniture situation" and concluding, "It will have to change its spots." In 2014, the share of Bordeaux traded on Liv-ex fell for the fourth year in a row, at a nine-year low of 79 percent compared to 95 percent in 2010 (fig.3, left). After hitting an all-time low of 72 percent in September, Bordeaux's share was back in the low 80s for November and December. "I don't think Bordeaux château owners have quite realized that sales of young Bordeaux wines are really, really tough," said Goedhuis. He has been recommending that his customers buy Bordeaux from 2005 and earlier, which "represent very good value compared to younger vintages." And sure enough, Goedhuis & Co's sales of these wines were up 14 percent in 2014 as his customers heeded his advice. The merchant's sales of Italian wines increased by 23 percent in 2014. This is in line with the growing trend for Italian fine wine, whose trade share on Liv-ex grew to more than 5 percent last year, having represented less than one percent of trade on the exchange in 2010. By contrast, Burgundy's share dipped a fraction. "I think a lot of Burgundians have seen what's happened in Bordeaux and are increasingly nervous," observes Goedhuis, who shares their concerns, though he says that, compared to Bordeaux's, their recent high prices "are much more understandable, given the number of extremely small vintages." The Burgundy 2013 en primeur release in January this year saw 90 percent of prices down or flat on 2012, and the tastings were as well attended as ever. For now, at least, Burgundy is whitewashed vintage dressers to Bordeaux's somber brown side-tables. But it looks like the leopard has another (final?) opportunity to change its spots in 2015. For the first time in three years, the global wine-auction market has risen in value, to $350 million, supporting positive noises elsewhere in the fine-wine market (fig.4, below). This represents a small increase of 5.5 percent on 2013, yet remains 26 percent down on the record results of 2011. The growth was thanks to the US market, which surged up by 28.6 percent on 2013, making up for declines in Europe and Asia. The US has consolidated its lead on Asia in terms of market share, now making up just under half of live-auction revenues, with Asia just shy of one third. The US also boasts the highest percentage of lots sold, at 95.1 percent compared to a global average of 90.5 percent, flat on 2013. Asia remains well ahead in one statistic, though: It is still home to much more expensive lots -- at c.$6,000 per lot, around double that in the US and four times that in Europe. 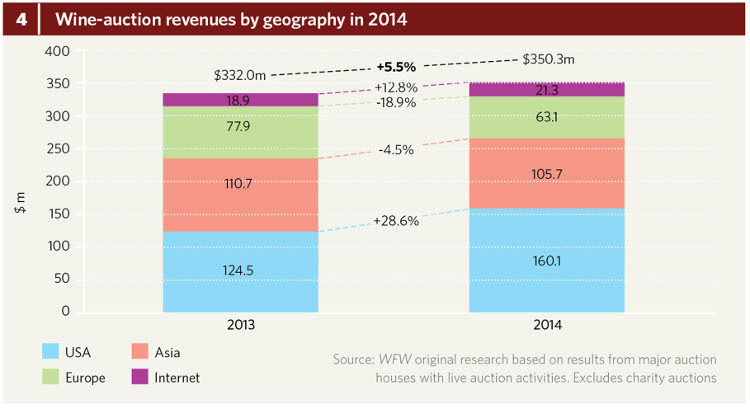 The proportion of revenue that the auction houses now derive from online only sales has also increased, by 12.8 percent (fig.4), though some of the more traditional houses, such as Sotheby's and Bonhams, still have not introduced online-only sales to their repertoire. This fact did not hamper Sotheby's from taking pole position, with revenues of $65.3 million in 2014 (fig.5). The house derived 22 percent of its revenues from single-owner or ex-château sales, a model growing in popularity among the auction houses and one that addresses the crucial issue of provenance. Sotheby's has six single-owner sales in the pipeline for 2015. Sotheby's was the only one of the top four houses to improve its performance on 2013, by 18 percent, with the largest number of auctions of any house, at 21 throughout the year (fig.5). Sotheby's, along with Christie's, has one of the most evenly spread revenue bases geographically, holding sales in the US, Hong Kong, and Europe, allowing it to respond nimbly to changing global trends. Sotheby's buyers in 2014 came from Asia (55 percent), North America (24 percent), Europe (18 percent), and Latin America (2 percent). King of the jungle in 2013, Christie's fell to third place last year (excluding the $10-million Hospices de Beaune charity auction), despite selling the most expensive lots in 2014, at an average price of $4,770 (fig.5). Meanwhile, Acker Merrall & Condit retained second place with revenues only 3 percent down on 2013. Zachys' revenues fell 15 percent year on year in spite of a strong sell-through rate of 95.5 percent. Having already lost a number of key staff members to Wally's new auction business in 2013, the firm's managing director for Asia, David Wainwright, resigned in November 2014, in another blow to the house. Wally's, meanwhile, made inroads in its first full year of trading, finishing in sixth place, in large part thanks to the sale of an entire single-owner collection from American bridge player Roy Welland for more than $12 million. This took the newcomer ahead of two-century-old Bonhams in one fell swoop but wasn't enough to threaten Hart Davis Hart's long-held fifth place. Number one in the US, the Chicago-based firm continued to grow its revenues (by 18 percent in 2014), in spite of staying firmly put in a single location. Nonetheless, Hart Davis Hart does employ two brand ambassadors in Asia and boasts a broadly spread buyer base. In wine-region terms, the winner was Burgundy, with 50 percent of the year's top lots (up from 47 percent in 2013). The top lot of the year -- and most expensive wine lot ever -- was a DRC Romanée- Conti superlot sold by Sotheby's: 114 bottles from 1992 to 2010. DRC was Sotheby's top-selling brand, representing $8.9 million of the firm's wine sales in 2014. Among the year's top lots were a few more from other regions, including Tuscany and California, while Bordeaux's representation was slightly down on 2013. Francois Curiel, chairman of Christie's Asia Pacific, noted that "2014 was another relatively quiet period for top Bordeaux, coming after record years of unequaled prices in 2010-11." He added, "In contrast, Burgundy wines increased in popularity, achieving strong prices for the best DRC." Curiel believes that Burgundy's success "was driven in part by Chinese connoisseurs, who more and more appreciate the harmony between Burgundy wines and Chinese cuisine". Some houses have observed that Bordeaux seems to be strengthening once again. After its Hong Kong auction in November, Zachys' president Jeff Zacharia said he was "very glad to see renewed interest in Bordeaux, as those prices seem to be firming up after a few difficult years." Overall, Bordeaux still dominated many houses' sales -- at 62 percent for Sotheby's, for example, up 2 percent on 2013. Furthermore, seven of Sotheby's top ten producers by value were from Bordeaux (the first growths plus Petrus and Cheval Blanc). In part 1 (WFW 46), I looked at the online wine-exchange services offered to the trade (Liv-ex) and by the trade (Bordeaux Index's Live Trade and Berry Bros. & Rudd's BBX). Here, I will focus on the newer, independent platforms open to private consumers and trade alike. There are three noteworthy examples, all based in the UK, by simple virtue of this being the world's largest hub of in-bond fine-wine reserves, as the historical center of the fine-wine trade. The first two, Cavex and Wine Owners, were launched just two months apart, in April and June 2013 respectively. Wine Bourse is the most recent player to enter the fray, in November 2014. All three provide online exchange platforms where anyone -- whether wine trade or not -- can list their wine for sale and browse that listed by other users. "Given how fragmented the market is, we saw there still being a significant opportunity for something that wasn't a closed environment," said Wine Owners founder Nick Martin. Rather than being the extension of a particular merchant, all three exchanges are at pains to underline their complete independence from the trade. This is confirmed by the official shareholder lists of Cavex and Wine Owners. (The latter boasts as an investor Simon Farr, the original co-founder and now non-executive director of Bibendum, along with other fine-wine interests, who brings his 40-year wine-trade experience to the table but has no control over the business operations.) Cavex's financial backers are nearly all City traders, whereas Wine Owners' are mostly in the worlds of private banking and law. Wine Bourse has not yet submitted an Annual Return, but founder, Matthew Starr, confirms the company is "completely independent." "We think our strength is in our neutrality," Martin told me. The fundamental advantage of Wine Owners' independence, says Martin, is "bringing as broad a range of product and participants as possible," thus increasing liquidity. "The other dimension," he continues, "is [that] we have no agencies or vested interests in pushing or maintaining a price on any wine or set of wines." He elaborates on the importance of this, saying, "If I was an importer of a château's wines, I would have a responsibility to those who bought en primeur, and probably to the château itself, to see the price maintained." BBX's Matthew Tipping argues that independence is not an issue in running a fine-wine exchange, saying that both buyers and sellers on BBX choose the price at which they are willing to exchange and that, in addition, buyers benefit from "a guarantee from a merchant with a huge history and reputation." He points out that sellers on BBX are free to undercut the BBR retail price for the same wine should they wish. I asked if Berry Bros. & Rudd ever buys wine from BBX to resell if there's a bargain to be had, but I'm told it is a company regulation not to buy BBX stock. "We occasionally contact a customer directly if we need that case, but it's rare," Tipping clarifies. Furthermore, the system flags a wine that has been listed significantly below market value and the customer is informed. If independence is a boon, it also has its downsides. One, according to Tipping, is that the newer platforms "may not have stock physically there under their control, so there are a huge amount of variables that can slow the process down." He continues, "There's no one else that has all the wines already there and inspected," concluding, "My understanding is that other players are having to draw in wines from other storage facilities, and that strikes me as being problematic." If it is such an advantage to hold stock in one place, I asked Tipping why other merchants haven't followed suit. He said he wasn't surprised, "knowing what I know about the wine industry and what I know about all the mechanics." He believes that having its own warehousing puts Berry Bros. & Rudd in a unique position, explaining that "using a third-party logistics provider adds a huge amount of complexity," due to integrating the back-office systems, which would add additional cost to the development of such an exchange. This argument would of course also stand for the newer, independent exchanges, which unlike BBX are not centered on stock in one particular warehouse but must link up with third-party warehouses. Starr has not let this deter him from his new venture, Wine Bourse, saying, "The bonded warehouses create an incredibly good platform," though he does not hide the fact that the development process in tandem with third-party storage providers has taken time and patience. Similarly, the initial development of the Wine Owners software and data did indeed cost double that of BBX, at around £400,000. With no existing systems to build on, this is not surprising, not to mention additional features of portfolio management and analysis. Shareholders in Wine Owners are yet to see a return on their investment. Since the site launched in June 2013, "well over £1 million but less than £3 million" worth of wine has been sold on the exchange, says Martin somewhat imprecisely, adding, "This is now scaling rapidly." The company is continuing to invest in its technology and will have launched a second version of its website by the time this article is published. Wine Owners is unique in its approach, offering a "complete solution" in the form of cellar management and data analysis alongside the fine-wine exchange. Martin was himself a wine collector, frustrated by the disjointed services on offer. "Let's provide an environment that can simplify the lives of wine collectors and give them direct access to the secondary market," thought Martin, for whom price discovery and understanding what one owns are just as important as an efficient trading platform. The Wine Owners website has an overtly consumer feel to it compared with the more functional branding of Cavex and Wine Bourse. It has by far the jazziest how-to video, featuring little cartoon characters and a professional voiceover. The platform allows users to keep track of their portfolios and provides information for each wine (such as pricing, in collaboration with Wine-Searcher), as well as collection overview analysis reports. There are 1,500 private clients using Wine Owners branded services (including cellar management), with just over 500 of these registered for trading (6 percent of the number using BBX, in a quarter of the time, to put it into perspective). Each month, a proportion of Wine Owners' portfolio management users progress on to the exchange. Users are around 80 percent UK-based, with the remainder hailing from the USA, Europe, and Asia. The majority of users are private clients, though "trade participation is significant and very much valued." Sales are mostly C2B or C2C, with only a little B2B. By contrast, Cavex's membership is less UK-heavy, with 67 percent of trade exported outside the UK, a high proportion of which goes to Asia (Hong Kong, China, Singapore, and Malaysia), as well as the USA, Australia, the Middle East, Russia, continental Europe, and, of course, a strong UK contingent. "The Asian markets in particular are taking advantage of [Cavex] because it allows direct access to secondary-market stock and increases the speed of collection, as they collect direct from the sellers' bonded storage account," explains Daniel Haigh, Cavex's operations director. Cavex and Wine Bourse differ from Wine Owners in focusing purely on the trading element. Both have aimed to create a streamlined product that replicates the trading experience in financial and commodities markets. Cavex's founders include two former City traders. Unsurprising, then, that this platform's focus is all about liquidity and efficiency. CEO Stephen Maunder compares the model to a bullion trading site, streamlined and to the point. "We're trying to attract somebody who literally wants to trade at the finest price," he says. "We're not there to inform," asserts Maunder, who says, "We've stripped it down to a very low-cost trading platform" that doesn't offer "analysis, pre-advice, critics' scores, or fancy photos of vineyards on the website." Starr also rejects the need for "ratings or elaborate wine descriptions" on the site, saying, "Wine Bourse clients are serious collectors and the trade; they know their wine already." Wine Bourse was born of "frustration" with the traditional fine-wine market channels, explains Starr, himself a collector. Previously a JP Morgan banker for 14 years, Starr expounds his "main theme" of "applying financial-market standards to trading fine wine." In that sense, the newer platform's philosophy resembles that of Cavex, though Starr claims that Wine Bourse is different in its strict approach to settlement. This approach can be summed up by the term "delivery versus payment," a common form of settlement in global-securities markets. This essentially means that a separate clearing company -- in this case, WineClear Ltd -- ensures the settlement of the transaction by assuming counterparty risk. For the trade to be matched, the bidder must have provided card details beforehand (or transferred cash into a prepayment account), while the seller must have provided an exact rotation number for the wine that matches the records of a UK bonded warehouse, to prove the wine's existence, as well as ownership of that wine. Starr accepts that a rotation could be falsified but adds that this would be a case of serious fraud, and he doesn't think it likely many would take that risk. "Wine is an extremely important asset," says Starr, "but it is traded quite amateurishly." He refers to the way stocks are purchased, scoffing at the idea that anyone could buy shares without putting any money down. "It's inconceivable," he declares, as is the notion of offering "millions of pounds' worth of shares without any proof that they exist or that you have the right to sell them." With Wine Bourse, Starr has aimed to recreate "the nuts and bolts of a modern financial market," and to that end the tiered system includes a custodial company, WineCustody Ltd, as well as the clearing company. Cavex addresses this with the simpler solution of a "segregated client account" at its bank to hold the buyer's funds while the stock is physically transferred. Next time, I will look at the two main challenges faced by wine exchanges. First, there is resistance to any change in the status quo that might threaten the somewhat arcane ways of the fine-wine market. Second, online wine exchanges emphasize questions of provenance related to the non-fungibility of wine. I will conclude the series with some comment on the likely future for these trail-blazing platforms within the very traditional fine-wine world. For the complete version of Liquid Assets, please refer to Issue 47 of the print magazine.